News from Haworth Shop. Did you know that our limited edition Bachmann Branchline MR 3F 0-6-0 43586, the engine that hauled the last British Railways steam hauled train up the Valley, is now available without lining and headboards at the amazing price of only £59, excellent value. Another member of the class currently retails at one of the country’s largest retailers in excess of £71 – hurry whilst stock last. 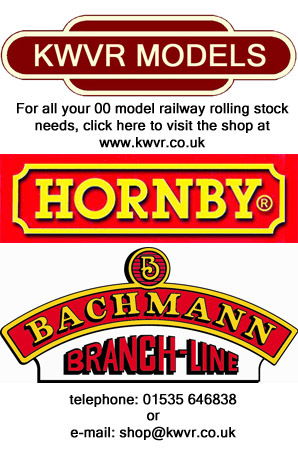 The railway model stock is priced competitively against the large model retailers and the three major brands Bachmann, Farish and Hornby are all extensively stocked. Why not reserve forthcoming releases you may require due to limited production. Phone 01535 646838, e-mail shop@kwvr.co.uk or, if you can, call in and see us at Haworth Station, browse, buy, save the postage and have a great day at the Railway. The full range of model railway rolling stock the Railway has on sale can be seen on the KWVR main site. Click here to see what the Railway has to offer.